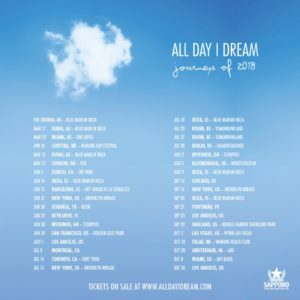 Today, Lee Burridge’s beloved All Day I Dream, has announced its 2018 World Tour. Since it's inception on a Brooklyn rooftop in 2010, this dance event has evolved into a global movement offering memorizing experiences unlike any other. Extraordinary city settings from around the world are transformed into music dance parties offering top-notch techno, tech house, and ambient DJ sets, all the while embracing the beauty of imagination and art through their unique event decorations and designs. If you're looking for the vibes, All I Day I Dream is something you just don't miss, trust us. From the site: Outside of the events the All Day I Dream label continues to support newly discovered artists as well as familiar family members like YokoO, Lost Desert, Hoj, Oona Dahl, Gorje Hewek & Izhevski, Powel and Bedouin. Recent releases include PHCK’s Elephants, Zone+’s Baia, Sébastien Léger’s Lost Miracle, Roy Rosenfeld’s When We Were Innocent, and Rebelski’s Paper 6-track EP.